An ever-so-slightly updated Lexus IS sedan shows its freshened face in China. 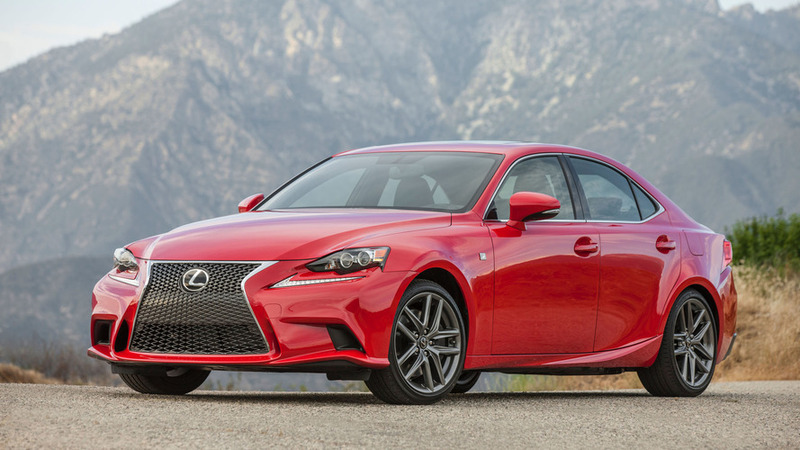 Look closely – Lexus’ IS facelift isn’t a huge departure from the car currently on sale. But considering how angular and stylized the current IS already is, that’s not necessarily a bad thing. “Because the original styling of the current IS has proved so popular, Lexus has kept the essence of car's exterior appearance intact,” the automaker says in its press blast. The most noticeable change is on either side of the lower front fascia, where more pronounced air intakes sit beneath slightly restyled headlights. The sedan’s spindle grille is also updated, though you probably won’t notice at first glance – it now folds back at a higher point, altering the proportions of the upper and lower sections. Around back, Lexus says there are more pronounced L-shaped running lamps and rectangular exhaust tips. Really, that’s it as far as changes go. Lexus says the powertrain options will remained unchanged which, in the US, means the IS 200t, IS 300, and IS 350, with F Sport packages available on all. The updated IS debuts in Beijing this week, but we expect the updated look to arrive Stateside for the 2017 model year. 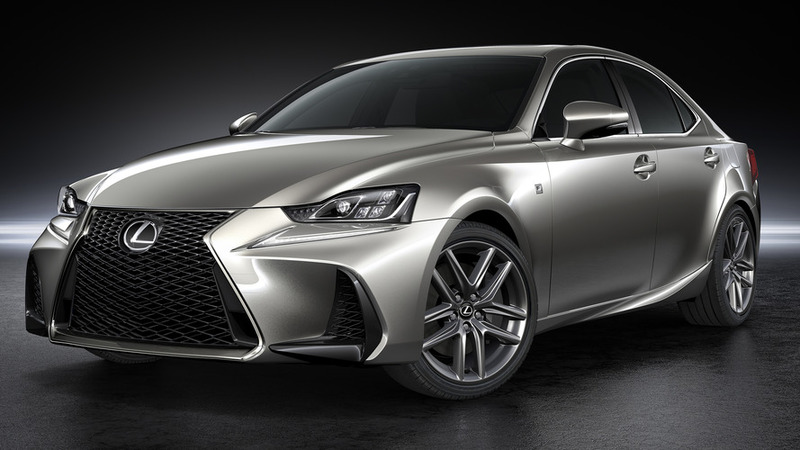 BEIJING, China (April 25, 2016)―A daring new styling direction, exciting performance and innovative technology defined the completely new Lexus IS that was introduced in 2013. Since then, sales of the luxury brand's entry-level sedan have surpassed expectations, outselling the previous-generation model, which was very popular in its own right. At the Beijing Auto Show today, Lexus has taken the covers off the new IS, armed with a fresh new look and a number of important changes. Because the original styling of the current IS has proved so popular, Lexus has kept the essence of car's exterior appearance intact; however, the entire front fascia of the new model has undergone a transformation, highlighted by new headlamps, large air intakes in the front bumper and an evolution of Lexus' spindle grille. The reshaped headlamps are more pronounced than before and extend inward, resulting in an eye-catching shape that accentuates the "L"-shaped Daytime Running Lights (DRL). The bumpers, with incorporated air intakes, flow dynamically from the fenders, giving the new front end a high level of aggressiveness. The new grille folds back at a higher point, changing its top and bottom proportions that enhance its sporty feel with a visually lower center of gravity, while blending effortlessly into the reshaped hood. The sleeker profile of the IS, together with the enhanced character line that runs down the side of the car, makes the new IS seem as if it's in constant motion even when sitting still. The F SPORT's grille features an exclusive 3-dimentional F-mesh pattern, with jet-black metallic coating that incorporates functional brake ducts. These brake ducts provide a sense of continuity with the side garnishes that enhance the vehicle's aerodynamic performance. Adding to the IS's dynamic flair are standard 10-spoke 17-in. wheels that boast new designs with bright machine finishes. Changes to the rear are highlighted by more pronounced "L"-shaped LED light guides that are now triple layered within the taillight housing and new rectangular chrome exhaust tips that accentuate the car's sporting nature. Also, two new paint schemes―Deep Blue Mica and Graphite Black Glass Flake―have been added to the IS's exterior color palate. In keeping with the same theme as the exterior, thoughtful improvements have been incorporated into the new IS's cabin. The first thing that's sure to catch your eye is the multimedia display screen that has grown from 7 inches to 10.3 inches. The new high-resolution monitor offers a larger and clearer image of the various functions of Lexus' innovative multimedia system. Also, an "Enter" button has been added to the side of the Remote Touch Interface (RTI) on the center console, making the system easier to use. On the center dash the audio and ventilation-control panel has been refined to fit completely within the knee bolsters, with a new hairline-finish surface that provides both a high-quality feel and improved appearance. New stitching on top of the meter hood enhances the sporty feel of the IS cockpit, as do the refined speedometer and tachometer. For select markets, two new shades of black and brown have been added to the interior color mix, including Nuance Black and Noble Brown. Also, Moonstone and Ivory have been replaced by Chateau, a new light shade that blends the elegance of Ivory with a more modern light-gray hue. Other changes to the new IS include new cup holders, a new larger leather-wrapped palm rest with stitching for the RTI and new markings on the in-dash analogue clock. The new IS model lineup will remain unchanged with three engine offerings. The rear-wheel-drive IS 200t will be powered by the recently-added 2.0-liter twin-scroll turbocharged inline-4 with intercooler, which comes mated to a smooth-shifting 8-speed automatic transmission. This engine, first introduced on the NX crossover vehicle, features a number of innovative technologies including Variable Valve Timing-intelligent Wide (VVT-iW) that allows the engine to switch between Otto and Atkinson cycles by varying the intake-valve opening angles, and the D-4ST direct injection system. It combines a high pressure fuel system for injection directly into the cylinders with a low pressure system for injection into the ports. Power is rated at 180kW at 5,800rpm or torque 350Nm at 1,650 to 4,400rpm. The new IS's safety equipment has been upgraded with the Lexus Safety System +. It combines Pre-Collision System, Lane Departure Alert (LDA) with Steering Assist, Automatic High Beam (AHB) and Radar Cruise Control.